"Today, Sullivan's Island epitomizes the unhurried, casual lifestyle of a beach community." Sullivan's Island is just minutes from all that historic Charleston and booming Mount Pleasant have to offer, yet it might as well be a thousand miles away. A sophisticated island town, it offers its residents and visitors no flashing neon signs, no shopping malls, no golf courses and not even a stoplight, just a small downtown district that features primarily upscale restaurants and watering holes. And that's the way the islanders plan to keep it. Originally known as O'Sullivan's Island after Capt. Florence O'Sullivan, an Irishman who was stationed there as a lighthouse keeper, the island paradise is drenched in history. The first patriot victory of the Revolutionary War was hatched there on June 28, 1776, at what is now Fort Moultrie. British naval forces led by Sir Peter Parker bombarded the fort, made of palmetto logs and sandbags, for 10 hours. The spongy logs absorbed the British cannonballs, allowing the militia to inflict much damage on the invading fleet and driving it from Charleston Harbor. Meanwhile, the Americans repulsed the efforts of a British force under Sir Henry Clinton to cross from Long Island (now the Isle of Palms) to Sullivan's Island and attack the fort from the rear. Fort Moultrie saw action in the Civil War and again during World War II, when its garrison was charged with watching for enemy submarines. The bunkers and battlements remain, facing the sea, and the fort draws many visitors each year. American author Edgar Allan Poe was stationed at Fort Moultrie during a stint in the Army in 1827 and 1828, using the island as a setting for his story, "The Gold Bug." The library, housed in a renovated bunker, is fittingly named for Poe. 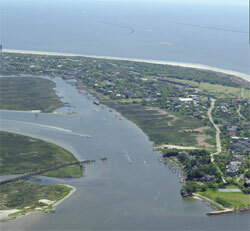 Today, Sullivan's Island epitomizes the unhurried, casual lifestyle of a beach community. Residents get around on foot, on bikes or in golf carts. When they need to leave the island, they travel across an old-fashioned drawbridge. There are no hotels of any sort and rental properties are frowned upon in this family-oriented, close-knit community.